What do you do if you end up in a tornado's path? With winds up to 300 miles per hour, this rotating, high-powered, funnel-shaped mass can flatten entire towns and cause massive amount of casualties in seconds. Following tornado safety tips, like the ones listed below, can give you quick and simple guidelines for increasing your odds of surviving a tornado. The key to staying safe in a tornado is to remember: get in, get down, and cover up. When a tornado warning is issued, immediate action is required. 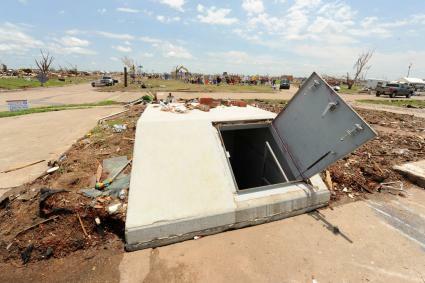 Although there is no completely safe place during a tornado, some locations are much safer than others. You find yourself at home when you realize a tornado is rapidly approaching. What next? Go to your in-home shelter, underground storm shelter, or basement, if available. Otherwise, choose the safest location you can find. In addition to the above listed recommendations, some situations require additional precautions. Special Needs: If you cannot get out of bed, you should cover up with blankets and pillows to help protect yourself from flying debris. Mobile Homes: Get out and seek sturdy shelter immediately when a tornado warning or a tornado watch is issued. Do not delay. Commercial Buildings: Do not use elevators and remember to shut doors behind you. Cars, buses, tractor trailers, and RVs are easily flipped over, crushed, or swept up by tornados. You should never try to outrun a tornado in your vehicle. In some situations, you may able to get out of the tornado's way by driving out of its path. However, this can be extremely dangerous unless all conditions are in your favor. Ultimately, your goal should be to locate the nearest sturdy shelter. If the circumstances are in your favor, you may have a chance to outrun the tornado by making turns out of the tornados path (typically, turns to the right or south). Remember: tornados can change paths quickly and other variables such as traffic congestion and lack of road options can make this a dangerous choice. The American Red Cross states that if you are caught outdoors in your car with an approaching tornado, you have three options to consider. First, immediately get into a vehicle, buckle your seat belt, and try to drive to the closest basement, tornado shelter, or sturdy shelter. However, if flying debris occurs while you are driving, pull over and park. Stay in the car with the seat belt on and put your head down below the windows, covering with your hands with a blanket, if possible. If you can safely get noticeably lower than the level of the roadway, exit your car and lie flat and face down in that area such as a ditch or culvert, covering your head with your arms and hands. This will put you below the strongest winds and flying debris near ground level. Your decision should be driven by your specific circumstances. Note: Highway overpasses should be avoided because the overpasses elevate you above ground level, expose you to accelerated winds and swirling debris, and offer little for you to grab to try to lock into position. Being outdoors and in the open is the worst place to be during a tornado. If you are out in the open when a tornado is approaching without sheltering options, you have limited options and little time to act. Try to avoid an open area with lots of trees that may become debris. Lay flat in a ditch, ravine, or culvert; try to get lower than the ground surface. Cover your head with your arms and hands. Use anything you have to cover your head, such as a bike helmet or backpack. Be aware of your surroundings when exiting buildings, looking out for unstable walls, ceilings, sharp and trip hazards, as well as gas and electric hazards. If it is safe to do so, check for injured or trapped persons; call out and listen for replies. Be alert to fire hazards. Use the telephone only in an emergency, to include your cell phone. Stay out of damaged houses or buildings; they are a collapse and electrical shock risk. Do not use matches or lighters, as these can result in explosions related to leaking natural gas pipes or fuel tanks. Stay away from power lines that may still be carrying electricity. Protect yourself from broken glass, nails, and other sharp objects. Listen for information and instructions from emergency personnel. Today is a great day to discuss with your family where the best tornado shelters are located, whether or not your family can invest in home tornado safety sheltering options, where to meet after a tornado, and review tornado safety tips.